If, like many people, you do not like answering the front door (especially on those cold, dark winter nights) without first knowing who is out there then maybe our video doorbell camera system would be ideal for you. I for one prefer to know who is outside without having to open the front door or peep from behind a curtain first! The video doorbell camera system allows you to tap the app on your mobile phone or tablet and check who has rung the doorbell. You can then choose to ignore any unwanted callers without having to open the door and deal with them face to face. You can even set a motion alert on the video doorbell and this will notify you on your mobile phone or tablet that there is some movement outside your front door, you can then see who or what might be lurking outside without having to look out of the window or open the door. This is a great device for so many people, offering safety, security and piece of mind. Elderly people especially can benefit from this device and because the video from the doorbell can be shared to another device you can have another mobile phone also receiving the alerts. Ideal if your loved one struggles to reach the door in time or feels frightened or unsafe opening the door to an unknown caller. The video doorbell camera even has a voice intercom so you can tap “speak” on the app and have a conversation with the visitor at the door. Perfect if it’s a parcel delivery etc as you can ask the courier to leave the parcel on the doorstep to be collected later. The video doorbell camera is very simple to set up and use and to make things straightforward we supply instructions that we’ve written ourselves (I actually use the video doorbell on my own front door)! So, we’ve covered how the video doorbell can be very useful for an elderly relative for example but it’s also perfect for your own home too. Allows you to view (from anywhere in the world) live video when someone rings the doorbell of your home (or, with the motion alert feature, is lurking outside your home). This can be useful if you’ve popped out to the supermarket for half hour or if you’re away on holiday for 2 weeks. The voice intercom allows you to give the impression that you’re home as you could reply with something like “I’ve just got out of the shower” or “I’m giving the children their dinner”. You can also set the camera system to start recording too so everything that goes on at the front of your property is recorded! The video doorbell offers nice clear images both day and night and is powered from a couple of 18650 rechargeable batteries. As the doorbell camera spends much of it’s time sitting in standby mode, these batteries will last for months before requiring a recharge and they’re easily removed from the doorbell when it’s time for charging. As you would expect, the WiFi video doorbell system is weatherproof although the area that these are usually fitted is often sheltered anyway. The actual doorbell button itself lights up at night time due to the motion detectors and so a visitor can easily see where to push! You can purchase our video doorbell with a plug in indoor chime, although most customers just use their mobile phones to alert them and you can also buy a charger for the 18650 rechargeable batteries should you need one. The device is also supplied with screws for installation at your front door and fitting is very simple. The app “Tosee” is free to download and use. 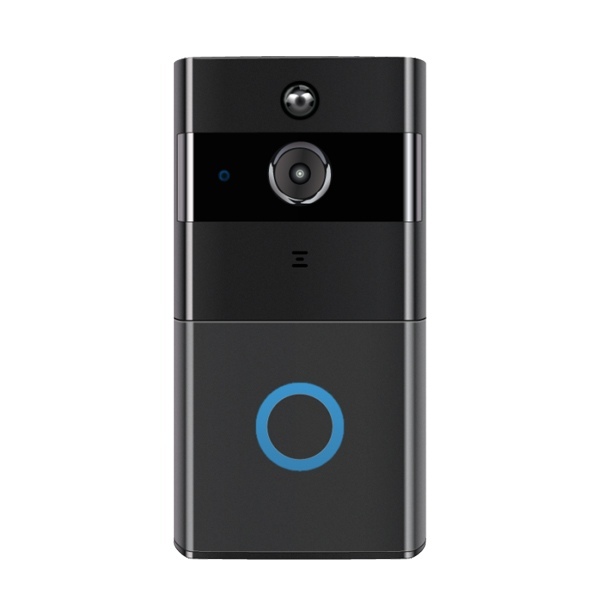 Many other video doorbell cameras on the market have an ongoing monthly fee for you to pay but ours is one simple purchase cost and nothing more to pay, ever!